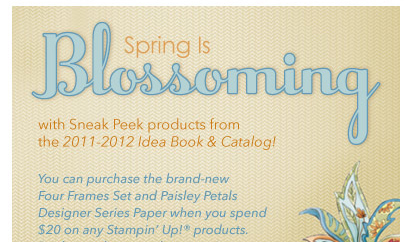 Promotion - Spring is Blossoming /Big Shot - Stamp to the MAX! Lots of fun things happening right now in the Stampin’ Up! world. Just look at these two beautiful cards created using the “Four Frames” Stamp Set and the “Paisley Petals Designer Series Paper”. When you spend $20 you are able to take advantage of purchasing the stamp set and paper (up to five items) before it is released in the 2011/12 Idea Book and Catalog which begins July 1. During the month of April *no foolin’* – you can purchase the BIG SHOT for 20% off. This offer is available to you, your family customers, neighbors and friends. Just ask them to use the code STTMBS. * If you shop online, you will receive a rebate check in the mail as it will not show the discount. All Big Shot Dies are 20% off also, so be sure to take advantage of this offer. E-mail me at maxstamps@yahoo.com with any questions.